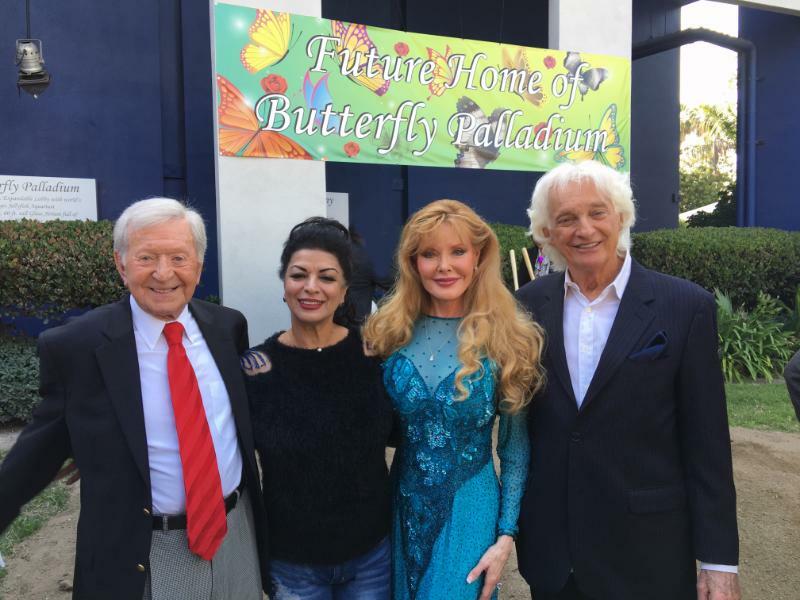 What an honor to perform at the groundbreaking ceremony for the new spectacular Butterfly Palladium in Anaheim near Disneyland! Planned for a Grand Opening in 2017, the Butterfly Palladium (on Beach Blvd. near from Disneyland in Buena Park) will be enclosed in a 40,000 sq ft atrium with thousands of rare species of exotic butterflies flown in from all around the globe, in a replication of the Costa Rican rainforest (replete with water falls, thunderstorms, etc. ), plus the largest jellyfish exhibit in the world and a world class theater for live performances. Pictured here with Lila and Rubin Stahl, founders of the project; Mr. Stahl is also the builder of the two largest Malls in the entire world – Mall Of America & the Edmonton Mall. “Float Your Dreams”, written by Joel Diamond is the theme song for the Palladium, and I was honored to record it with Joel and our brilliant arranger/ musician, Ted Perlman. This beautiful song had its live debut when we performed it for this ground breaking ceremony.